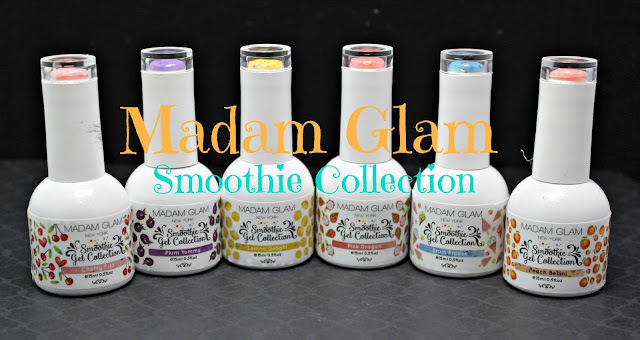 Madam Glam sent me so awesome gel crellies to show you and I really can't wait to show them off to you! 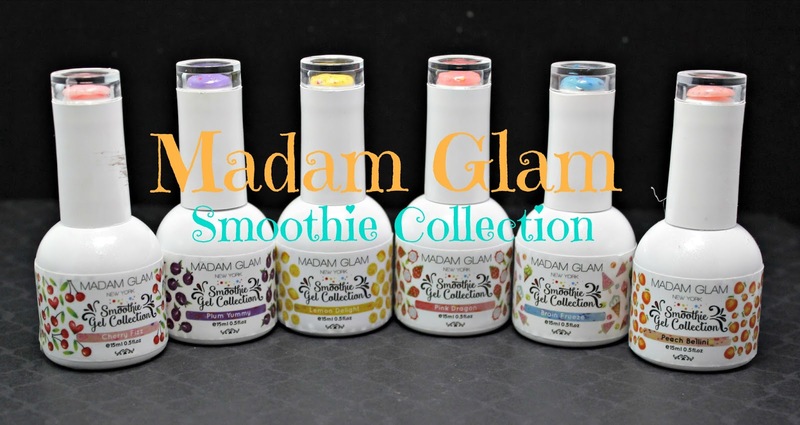 There are a total of 36 colors in this vegan and 5-free collection and I have 6 that I am going to give you a little peek at. For the most part, they are so easy to use- as long as you understand how gels work. 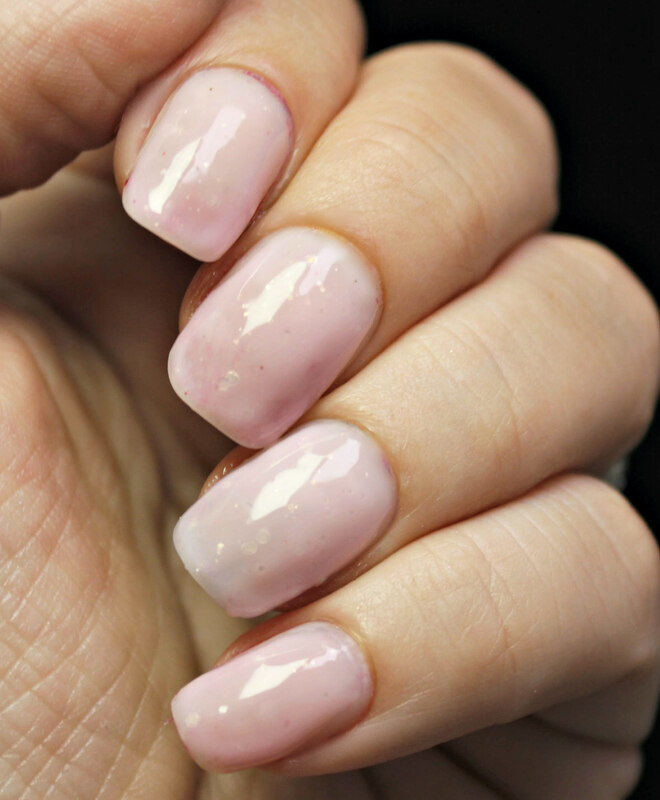 The formula for these polishes are VERY thick- like most other gels. 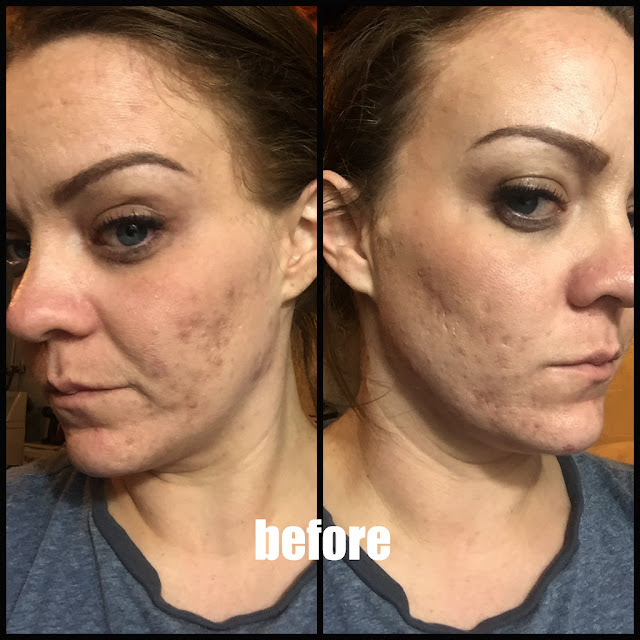 When you apply them, you need to work with thin layers. DO NOT glob them on thinking you will build faster because the polish will just burn when you cure it. 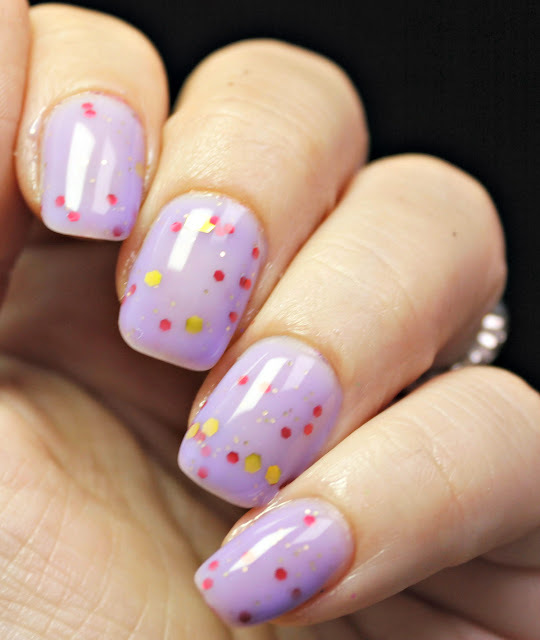 Don't forget to prep your nails by cleaning them with alcohol and drying them completely. 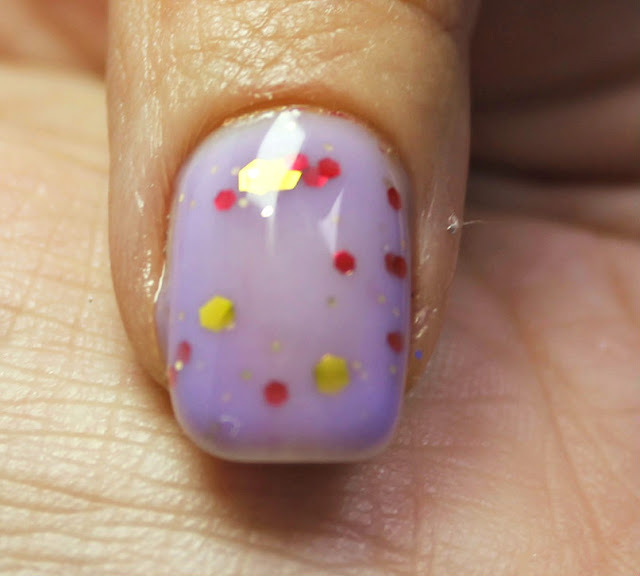 This gorgeous lilac polish is a beautiful crelly with large gold hexes, red circles and gold micros throughout. This applied very nicely- thick, but easy to apply in thin layers. The awesome thing about this polish is that I didn't have to fish at all! What is on my nails in the pictures is what I got directly from the brush. I didn't cure this one but I can say it dried just as nice with a regular quick dry topcoat. Again, I cannot say it enough, do not clump this on. Light, thin coats is the name of the game. This is my favorite color from the 6 I got to try. 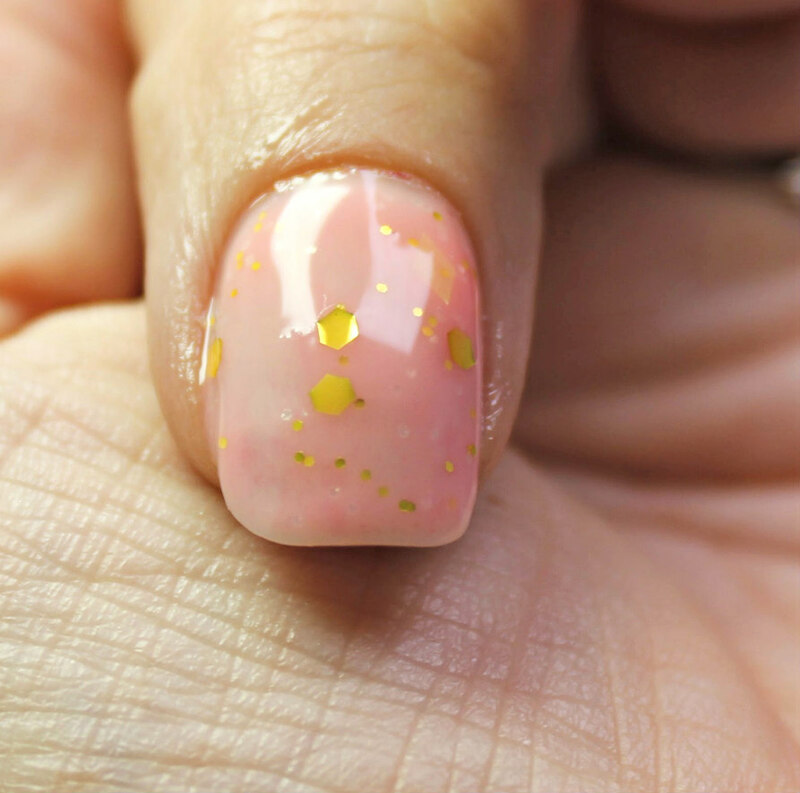 It is a light pink with large golden hexes and smaller golden micro scattered throughout. I love the pink and gold combos. I think they look so fun BUT also so classy. This one, again, was thick to apply but had a generous amount of glitter in each stroke. This is a little bit more sheer than the rest, but it also builds very nicely. Bluuuuuueeee! I am not such a big blue fan, but this color is so pretty with the glitter mixed in. It reminds me of cotton candy or better yet, cotton candy ice cream! Yum!! Brain Freeze is a baby blue base with medium red hexes and blue micro glitters throughout. I actually ended up using 2 coats with this one because it was a little thinner than the rest. This color is so fun! It was another favorite of mine and I think it's just because it's that pinky peach color. 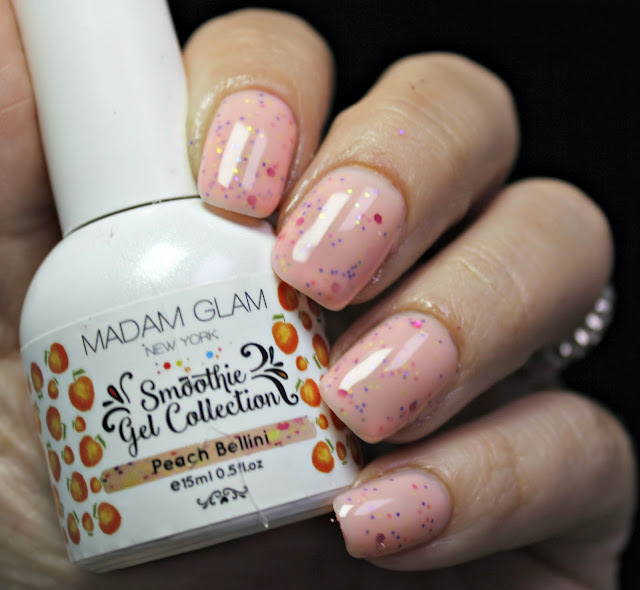 The base for this color is a light pinky peach and has medium pink hexes and multicolored micros scattered throughout the polish. 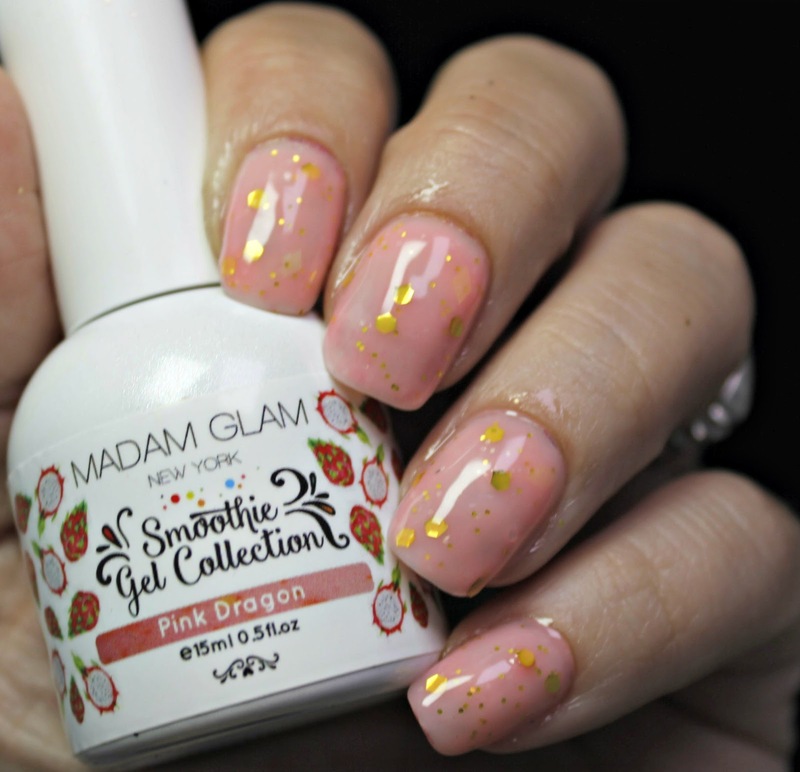 The glitter and color combination in this polish just makes it so fun and irresistible. I did go a little thick with this one and do regret not going thinner with the coats. This color is pretty sheer so it was hard for me to build without going too thick. Next time, I would go with thinner and take the sheerness! Awwwww... that's what I said when I first put this on. It is so delicate and sweet looking. It reminds me of all my favorite things in the world! 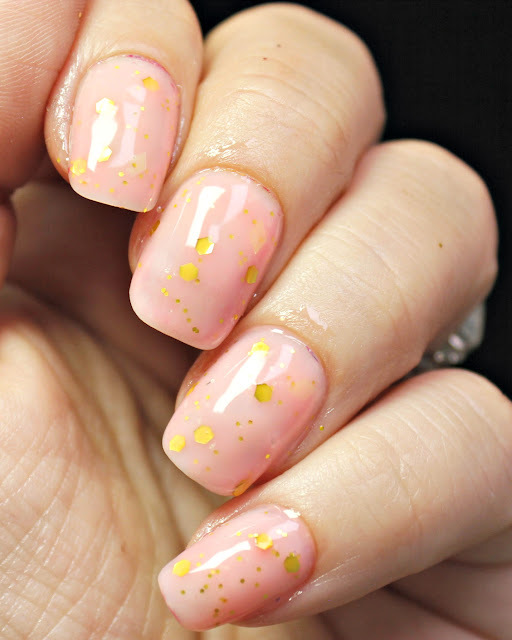 lol This sheer, light pink base is mixed with medium iridescent hexes and pink and iridescent micros. If you are looking for a dainty, but fun look this is your polish! I also wanted to mention that the packaging is awesome! The round bottomed bottles showcase a swatch of its contents in a clear plastic lid. The brushes are easy to use and the bottles are comfortable to hold. The bottles are actually decked out in a white holo. I'm not going to lie, but I am soooo not a yellow person. I think it has a hard time with my skintone. 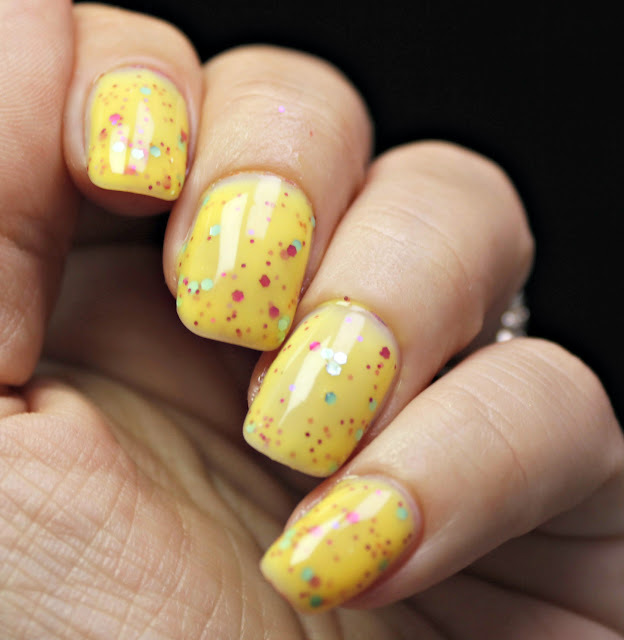 I see soooo many fun yellow polishes, it just stinks that it doesn't look good on me. 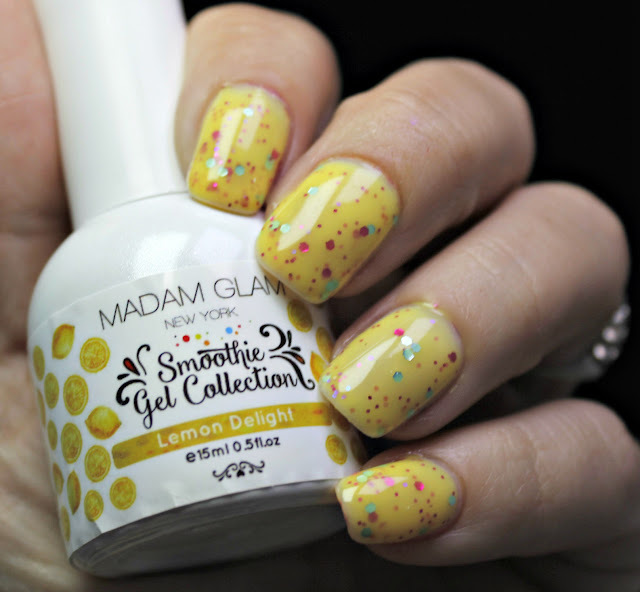 Either way, this is a super fun and festive polish! This canary yellow base is laced with medium red, green and yellow hexes and red micro glitter. It was easy to apply; again in thin coats to build. This color makes me think "beach"! I miss it already. All of these polishes are $19.95 and can be found here. Yes, that does seem a little steep, but these are gels so the polish lasts longer than most. I did do a wear test and I actually got a full 13 days out of it. 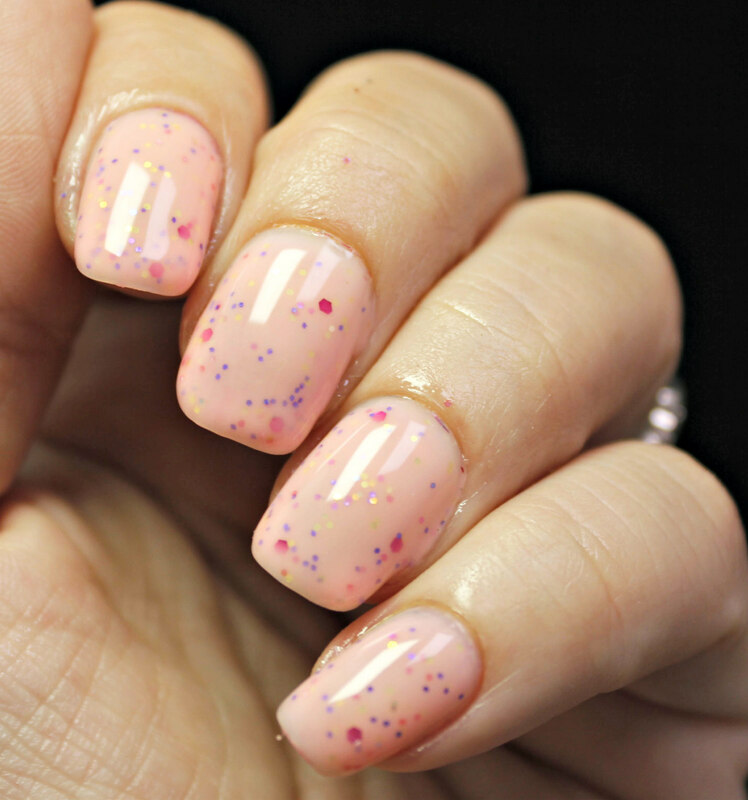 If you are a gel lover and are in the search for an indie-like gel polish, these would be worth looking into.